Yes, i’m studying Italian and have bit off more than i can chew. Let’s back up some and wonder why in the world at 77 years old and half dotty, i am taking up an intellectual endeavor as challenging as learning another language. Part of it, of course, is that i just love languages, ummm, at least Indo-European ones. And i’ve studied Spanish, French, German, and Dutch enough that i can get along marginally in all of them although none is even close to fluent. There are three other languages that particularly interest me – Frisian, Catalan, and Afrikaans. Frisian has the advantage of being rather close to English and even closer to Dutch, but the disadvantage of having only 400,000 speakers of the primary dialect, which makes it highly unlikely to be useful unless i move to Ljouwert. Worse yet, Frisian is distinguished by its large number of vowel sounds….all the standard pure sounds plus every imaginable diphthong and even some triphthongs, a language that is warbled rather than spoken. Considering that my weakest point in language acquisition is the sounds and that my hearing is failing, Frisian is clearly off my plate. I’ve found Catalan fascinating ever since when i was in London and heard the guys next to me in a bar speaking and discovered that even though i was on the brink of understanding them, i couldn’t quite comprehend. Finally, i broke down and asked. They laughed and said that they got that question continually and that often people would edge closer and closer until their ears nearly touched the speakers’ lips before giving up and asking. How little it takes to fascinate me. Unfortunately, while there are about ten million speakers of Catalan, they are concentrated in Catalonia and its adjacent regions, so it wouldn’t be useful unless i moved to Barcelona. Of course he knew since he had learned English, but what a delicious response underlining the near absence of them in his language. (Actually, the only two irregular verbs in Afrikaans are their words for “to be” (wees) and “to have” (hê), which are irregular only in that their infinitive is not the form used in all conjugations, as is normal. For example, “wees” is conjugated in all three persons, singular and plural as “is”, which means “is” and sounds like English “us”. But i digress, and anyhow, Afrikaans is out because South Africa is too far away. But why, since it’s not a language that i was particularly interested in, am i studying Italian? Easy. My wonderful Spanish teacher has gone on strike and is on a wild fling teaching Italian instead. And since he’s such a good teacher, fascinating polyglot (he also teaches a class in Yiddish), and entertaining man, i’m stuck studying Italian. About half the class are people like me. The other half are people with Italian roots so embarrassed by their inability to speak the language that they’re doing something about it. It’s a great class, and it’s so exciting that by the time each session ends, i’m exhausted. So why am i complaining? See, when Armando announced that he’d be teaching Italian instead of Spanish, i thought, being half-competent in Spanish and French, it would be sort of between them. Oh silly me. What i’d not taken into consideration is that it is closer to the Vulgate than Spanish or French and is thus more highly inflected. I remember fondly kidding my German friends about the utter ridiculousness of having six words for “the”, so you can imagine my horror when i discovered that Italian has five words for “the” before masculine nouns (il, i, l’, gli, and lo) as well as an additional two before feminine nouns (la and le). Also, Italian forms contractions of common prepositions with articles, so to the above list we’ll need to add the following: nel, nella, nei, nelle, al, alla, ai, alle, dal, dalla, dai, dalle, del, della, dei, delle, sul, sulla, sui, sulle, and coi. And then, when Spanish forms plurals by simply adding “s”, there are three pages of rules for creating the plurals in Italian. That’s just stuff out of the first couple of weeks, but to make matters worse, when i broke my back back in June and could no longer ride the Segway, getting to class meant taking the 24 Divisadero bus and then transferring to the F Market streetcar, for which i simply didn’t have the strength at first and the will power later, so i missed a month of classes before i finally dragged myself back. And we all remember from our undergraduate days how excruciatingly difficult it is to catch up in a class when you get behind, particularly a class in which you were already struggling. I always did well in language classes, but in this one i’m probably the least proficient person there. But hey, the only harm is to my pride, and at least i’m now able to pronounce understandably everything on an Italian menu. Late note: A kind reader got back to me and triggered an Aha moment. But wait, i thought, how come all the southwest American and Mexican cities were named “San” something since the conquerors were Spanish rather than Italian. Oh, of course, they were first and foremost Catholics, so all the saints had Italian names. To think that since childhood i’d thought that San Antonio and later San Francisco were Spanish rather than Italian. Meanwhile, my jaw dropped when i saw this can in the ice trough at a garden party. Then i grabbed and guzzled it with fond memories. 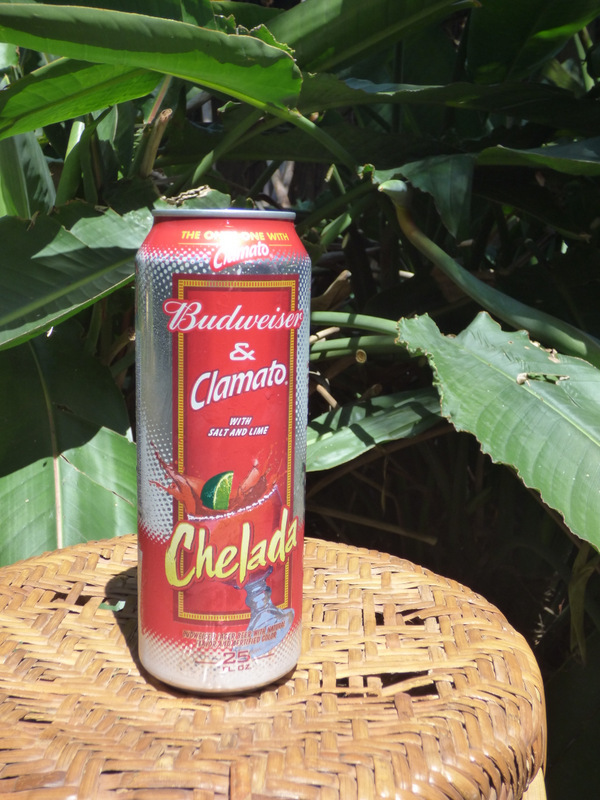 I never dreamed i’d see this concoction in a can, but it was a great favorite in Texas bars in the seventies although they just poured a mug about a third full of tomato juice (Clamato being too expensive), filled it with draft beer, and called it “Red Tap”. I loved it. When i told Californians about it years ago, they refused to believe that even Texans would drink such an atrocity. I don’t know this for a fact, but I think that the Christian saints have Latin names, not Italian names. When the priests named the missions in the New World, the Italian language did not exist. Do i love my readers or what! Your comments were food for thought, and i was fascinated to learn Venetian dialect for “Louis” and that our first names come from the same root. Wow. Trying to decide when the Italian language originated is quite complex and leaves ample ground for widely divergent dates. Certainly manuscripts from the 10th century were written in Italian dialects, but hardly anyone would date the origin of Italian so early. On the other hand, Dante completed the Commedia in 1320, and it is routinely lauded as the first work in the Italian language even though Dante wrote it in the Tuscan dialect. The Spanish priests started missions in the New World early in the 16th century, and it wasn’t until the unification of Italy in the middle of the 19th century that the Tuscan dialect became standardized as the Italian language, so it can certainly be argued that the Italian language didn’t exist, at least officially, when the Conquistadores were setting up New World missions. Ummm, yes, except that it was essentially the same language written six centuries earlier by Dante. Gets complicated. For me it gets even more complicated when i look at all our place names with “San” when the Spanish is “santo” and the Latin is “sanctus” and i found “san” in an Italian dictionary. So that’s why i jumped to the conclusion that the missions were given Italian names. Your comment made me realize that my jump was ill considered, which is a nice way of saying it was ridiculous. So i put a little more thought into it. First, while i agree that those place names are not Italian, i can’t believe that “San Antonio” or “San Francisco” are Latin. So i did more digging and discovered that “San” is an accepted Spanish contraction for “Santo”. Thus, i was right originally when i thought the names were Spanish before i foolishly decided they were Italian. It is quite reasonable that the missions were given Spanish names since, after all, the vast majority of the conquistadores didn’t speak Latin. Many thanks for making me think about this and research it.